Ansprechendes Ferienhaus im Ort Nowe Warpno in Westpommern. Das Ferienhaus befindet sich auf einem geschlossenen Grundstück mit eigenem Steg, von dem Sie angeln und auch baden können. This holiday home is situated on a well-maintained and an enclosed garden plot, amidst a picturesque surrounding. There is a covered terrace with a bricked barbecue and a wooden table. This modest, wooden holiday home is ideal for a retreat from stressful everyday life. 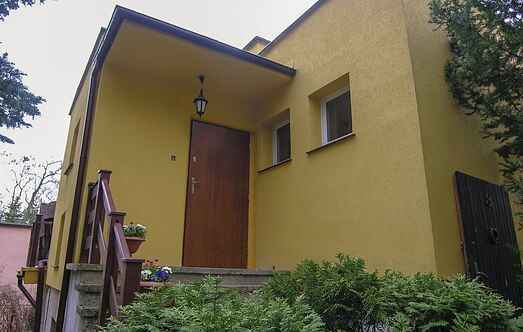 The home is wonderfully placed in Wieprz and is just 50 metres from Lake Jeziorak. We would like to invite you to a vacation in this beautiful wooden house very much. This charming house is located in the health resort Kolobrzeg/Kolberg on the Polish Baltic Coast. The house is very spacious and well equipped. This lovely holiday house offers plenty of space. It is modern and is located on a shared, fenced plot. The property with fresh furniture is aesthetically very beautiful. Contemporary house in the green Nowe Warpno. This cottage is suitable for a holiday at any time of year. It lies on the large, fenced plot, not far from Nowowarpieńskie lake. Holiday house in Mielno. It is modern, comfortable and practical and can accommodate one or more families with children. The house has every comfort. Beautiful wooden house on a closed and shared property, located on the edge of the forest in the village Jeżyce. It is decorated with modern furnishings tasteful. Water source: Lake Mielno. This comfortable holiday home on a huge natural ground has a lively atmosphere. You can rent the billiards table here. This modest but cosy holiday home is in a beautiful location. Due to its close proximity to the lake and the neighbourhood full of trees, you can relax amidst lot of fresh air.